outside my window... drizzly rain, light gray clouds, and everywhere green! i am thinking... about making sure what is really important is kept as really important. this is not easy for me. i am thankful... that the Lord loves me unconditionally. so often i feel as if i should have to earn His love and so often i fall short. remembering... that it will never all get done. there will always be more to do or things that i didn't get to. my idealistic expectations are not reality. from the learning rooms... i am reading library books trying to learn quickly more about gardening and how in the world to raise chickens. and then i get to learn from the doing of it as well. from the kitchen... we have been eating a lot of lentils and rice, and beans and homemade tortillas and produce. it is a good thing we like beans, lentils, and rice because they are affordable. and i just can't give up fresh produce. being a vegetarian for 8 years definitely had its lasting effects on me. however, i will be glad when we buy some meat because it has been sounding really good lately. i am wearing... jeans (my staple) and a long sleeve light weight sand colored shirt. bare feet. cherry red toe nails. wet hair. no makeup. i am creating... gifts. i am experimenting... trying to be creative with what i have here to give. i am hoping it all turns out! i am going... to keep pressing into learning how to love the Lord. to be honest, i don't always have the warm fuzzy feelings. how i wish to have those feelings! i love them. i don't always feel full of faith and conviction of the realness of God and following Jesus. i know that i can't rely on always having feelings. some days it just makes more sense than other days. some times i am more engaged than others. but i press on. i keep going. and when i fall down, i get back up and pursue this life of knowing God and being a christian mom, and faithful wife, a lover of Jesus, and a member of our house of prayer. and i pray for myself - that He would give me the grace to love Him, the grace to pray, the grace for it all to make sense on the days it just doesn't make sense. i am reading... just finished the book of jeremiah in my Bible reading challenge. i had a harder time staying focused during this book. i am realizing, once again, that i am in such need of the Holy Spirit opening my eyes and ears and heart to actually receive revelation from the Word. it isn't enough to just read it! we need grace to receive it. i am hoping... that i really get a chance to connect with the Lord about this important week - the passion of Christ! i still feel disconnected from the fact that right now we are celebrating the greatest gift ever given to us. i want that heart connect. i want to be able to connect my four boys to this wonderful week and have it come alive for them and for them to get it. sure, we do an egg hunt and they get special candy on sunday... but that is so not what it is about. it is about His death and resurrection. i want to experience this for myself and my family. i am hearing... the blessed sounds of the prayer room right now. what a blessing to be able to turn it on at any time of day and just allow the tenderness of the Holy Spirit to minister to my weary heart. around the house... let's not even talk about around the house. all my plans of getting stuff organized and cleaned out just haven't happened like i hoped. the backyard is the main project right now and is taking way longer than we thought it would, and a lot more money too. it will be so good when it is done and the inside can get some attention. one of my favorite things... is a sleeping baby. i don't know why, i mean i love awake babies, but there is nothing like a sleeping baby. a few plans for the rest of the week: easter is on sunday and we will be spending time with my family. otherwise, not a very eventful week from here on out. i like that. the first half of the week was busy enough for the whole thing. what do you think? 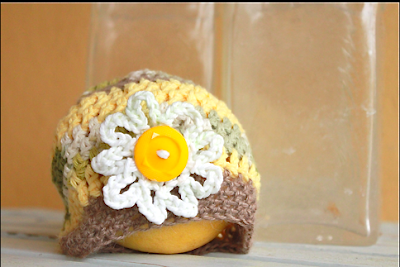 a new hat on my etsy store. the flower is removable so that this can be a gift for a baby shower for the "surprise" baby. it can be a girl newborn hat or a boy newborn hat!